Armin Strom is one of the 50 watch brands taking part in this year’s edition of Only Watch by Christie’s, which will be held in Geneva on November 11, 2017. Manually wound Caliber AMW11 boasts 112 components including 20 jewels and is one of many completely in-house Armin Strom calibers: the design and all components are original and manufactured in Armin Strom’s Biel factory, with only the springs and jewels being outsourced. Head of technology Claude Greisler’s goal for this eye-catching movement was a link to the traditions of both Armin Strom and horology as a whole, which gives it a distinct vintage look: 36.6 mm in diameter, its design looks influenced by the marine chronometers of yore, which is not an inapt comparison as reliability is one of the great advantages of this caliber. The beautiful screw balance with its regulating screws and a Breguet overcoil balance spring is on full display through the sapphire crystal case back as it beats at a sedate, vintage 2.5 Hz (18,000 vph). The power reserve of 120 hours (five days) makes this watch a joy to wear as it combines the best of both worlds: the gorgeous aesthetics of a manual-wind watch with the long power reserve often only enjoyed with automatic watches. A signature element of Armin Strom’s watches right from the beginning has been the inner mechanics exposed for the wearer to see from the front as generally these are decorated in some aesthetic way – normally very contemporary in style. Since Armin Strom’s first in-house caliber was introduced in 2009, the brand has promoted more modern forms of skeletonization, with designs integrated into the layout of the movement right from the early development stages. However, Caliber AMW11 is not one of the brand’s production skeletonized movements, making its exclusivity and “whole” dial perfect for the Manual Hunt Slonem Edition for Only Watch 2017. Caliber AMW11 was the perfect choice to power this large, yet lightweight titanium watch as the visible movement is covered in art, including the slightly off-center display of hours and minutes as well as a subsidiary seconds dial at an unusual 9 o’clock position. The only mechanical elements left unadorned – as in not covered in the colorful patterns created by Hunt Slonem – are the spring barrel and some of the gear train including the center wheel. The dial side of this watch has more or less been hijacked to become a screen for the art of New York-based artist Hunt Slonem. Slonem, born in the United States in 1951, is a painter, sculptor, and printmaker who creates art chiefly in postmodern neo-expressionist manner, an artistic movement that favors the coarse handling of materials, roughly – and even sometimes violently – portraying recognizable objects. The genre often utilizes vivid colors, though sometimes abstractly. And so it is here, evident in the hand-signed original work of art by Slonem the winning bidder receives along with the watch: a harsh figure in oil mixed with metal pigments painted on a wood background measuring 46 x 31 centimeters named Rex that originates in a series called Bunny Wall. 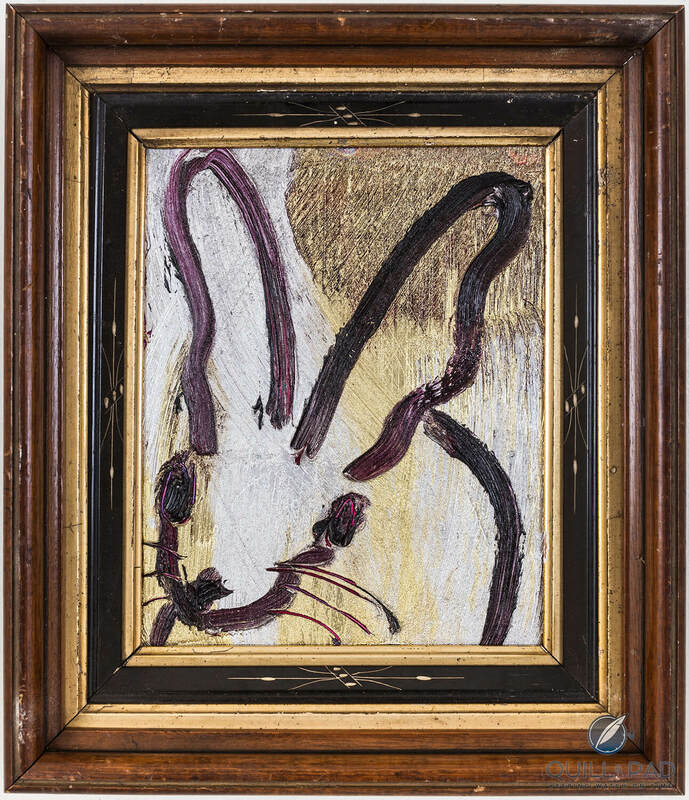 This painting, part of series of rabbit-themed art that famously includes bunny wallpaper, docks into Slonem’s allusion to hip-hop culture that the rabbit symbolizes (get it? “Hip-hop”). Slonem’s Chinese zodiacal sign is the hare, which may be why he has been painting the creature since the early 1980s. This particular bunny reflects the same pastel colors and strong lines found on the Slonem-decorated Armin Strom watch, which a transfer process was used to create. Armin Strom CEO Serge Michel and his family are very involved in art, often supporting artists and museums, which is certainly the background to (and necessity of) creating a watch like this with such a serious artist. Michel visited the artist in his Brooklyn studio in May 2016 for the first time; apparently they liked each other enough to decide to create this watch together – which is nothing short of excellent for the Only Watch cause. For more information please visit www.onlywatch.com/the-watches/armin-strom and/or www.news.arminstrom.com.